The Sultan Thaha Airport serves the city of Jambi in central Sumatra. It is a medium-sized airport with daily flights to all the major cities in Indonesia. The airport does not serve international destinations. The airport is named after Sultan Thaha Syaifuddin, the last sultan of Jambi. Distance from city center: 6 km. Which airlines fly to Sultan Thaha Airport? How many runways and passenger terminals does Sultan Thaha Airport have? The Sultan Thaha Airport has one runway and one new terminal, which was opened in 2015 with a capacity of 1.8 million passengers a year. The terminal has all modern facilities with airbridges, escelators, shops and restaurants. Where is Sultan Thaha Airport located? The airport is located inside the city on the Jl. Soekarno-Hatta, about 6 km southeast of the city center. 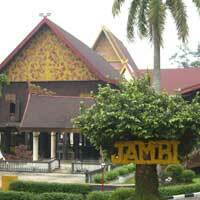 How to get from the airport to Jambi city centre by public transport? At Sultan Thaha Airport airport buses depart to several destinations in the city. Currently there are four lines and one-way prices are between Rp. 25.000 and 40.000. Tickets can be bought at the counter just outside the arrival terminal. A cheaper option is to go outside the airport gates and catch a ojek or angkot to the city. An angkot would cost Rp. 3000 while an ojek should be about Rp. 10.000. How much does a taxi cost from the airport to Jambi city centre? A taxi into the city is relatively cheap since the city center is so close by. Depending on your exact destination and time of day, a taxi would take about a half hour and cost Rp. 50.000 to Rp. 100.000. What are popular destinations from Sultan Thaha Airport?